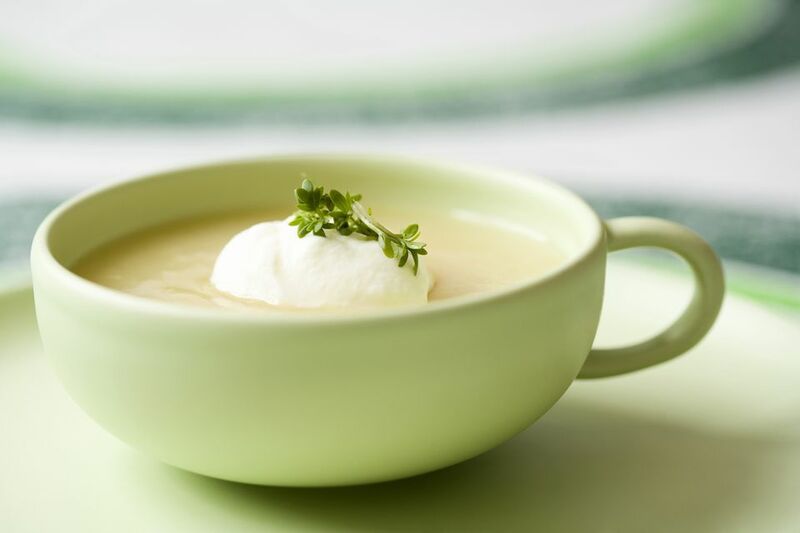 You can think of turnip soup as the gateway to turnips. Far too many people's first experience with turnips involves a sodden, overboiled, bitter root vegetable with a squeaky texture, and in nearly as many cases, that first experience also winds up being the last. One of the issues here is that boiling is almost never the best way to prepare a vegetable— indeed it's often the worst. And this is certainly true of turnips. (On the other hand, roasting them is great, and they're especially good as part of a mix of roasted vegetables). The other thing is that bigger, more mature turnips can have a tendency to be slightly bitter. Baby turnips, on the other hand, have a more delicate, sweeter flavor. For a slightly thicker soup, peel a small Russet potato (or half a large one), dice it up the same size as the turnips and cook it along with them. When you puree the soup, the extra starch will give you a thicker soup. Trim the greens off the turnips and reserve about a cup of the greens. Cut the turnips into (roughly) same-sized pieces, about 1/2 inch to 1 inch thick, depending on diameter. Don't worry about precision—the soup is going to be puréed anyway. We just want the pieces to be of uniform size so that they cook evenly. In a heavy-bottomed soup pot, heat the butter over low-to-medium heat. Add the onion, garlic, and turnips and cook for 2 to 3 minutes or until the onion is slightly translucent, stirring more or less continuously. Add the wine and cook for another minute or two or until the wine seems to have reduced by about half. Add the stock. Increase the heat to medium-high and bring to a boil. Then lower the heat and simmer for 15 minutes or until the turnips are soft enough that they can easily be pierced with a knife. Don't let them get mushy, though. Meanwhile, wash and dry the reserved turnip greens, then finely chop them and sauté in a pan with a little bit of oil or butter until they're tender and wilted. Season them with a bit of Kosher salt and set aside. Remove the soup from the heat and purée in a blender, working in batches if necessary. Return puréed soup to pot and bring to a simmer again, adding more broth or stock to adjust the thickness if necessary. Stir in the sautéed turnip greens. Stir in the hot cream, season to taste with Kosher salt and white pepper and serve right away.